Sometimes change happens in the most unlikely ways, fostered by the most unlikely of people. In the last few years, while Israel’s relationship with the Arab and Muslim world has drastically deteriorated, an Israeli heavy metal band has been uniting thousands of Jews and Muslims across the Middle East. Orphaned Land, Israel’s biggest heavy metal band, is credited both with pioneering the genre of Middle Eastern metal and garnering thousands of fans in Muslim-majority and Arab countries, including Turkey, Lebanon, Syria, Jordan, Saudi Arabia and Iran, despite the fact that their music is banned in many of those countries. Orphaned Land, whose members are not overtly political, are nevertheless proud of having created a reality in which music succeeds where politics too often fails. They tout the power of music to turn purported enemies into friends, frequently paying homage to and encouraging collaborations with Arab and Muslim artists. To foster this coexistence, their latest album is available to download for free in a number of Middle Eastern and North African countries. Reciprocating the band’s courageous efforts, Divan, an Iranian rock magazine, featured Orphaned Land on their cover in an eight-page spread. In 2010, the band was awarded a peace prize by Istanbul Commerce University for their contribution to the friendship between Muslims and Jews in the Middle East. And in February, during a five-city tour of Turkey (proceeds from the Istanbul concert went to victims of a recent earthquake) Orphaned Land was awarded The Friendship and Peace Award from Dr Huseyin Tugcu, an advisor to Turkish Prime Minster Recep Tayyip Erdoğan. How did this happen and what can we learn from it? The story of an Israeli band’s surprising success in the Muslim and Arab world rests on three pillars: music, examples of cooperation and community. Heavy metal is a growing genre in the Middle East and North Africa. Orphaned Land pioneered a style that fuses heavy metal with traditional Middle Eastern instruments, melodies and rhythms. In doing so, they managed not only to tap into a regional aesthetic sensibility, but also to demonstrate that the Jewish people have roots in the Middle East and that engagement with globalisation does not necessarily have to lead to erasing local culture. 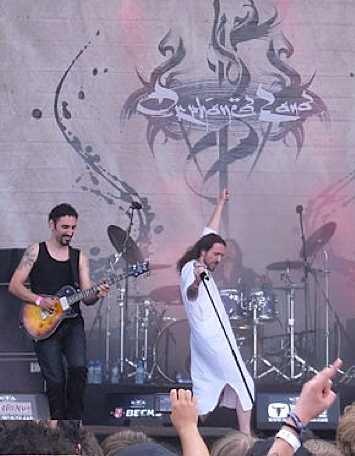 Singing in English, Arabic and Hebrew, Orphaned Land has peppered their lyrics, which often deal with the struggle of light over darkness, with quotes from the Torah, New Testament, and the Qur’an – the latter of which they received some criticism for. With a vision of ecumenical spirituality, Orphaned Land has also managed to connect with an ever-opening religious sensibility that is part and parcel of the modern Middle East. 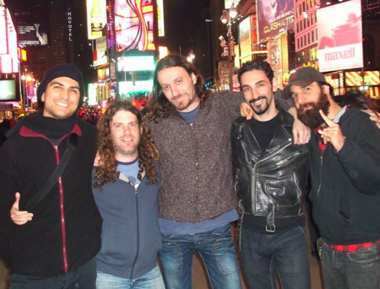 As for setting an example of cooperation, Orphaned Land has worked with Muslim and Arab artists over the past few years. On their 2010 album, The Never Ending Way of ORwarriOR, the band joined forces with the Arab Orchestra of Nazareth as well as Zen Two, a Jordanian artist who designed the artwork for the album. And just this year, the band, accompanied by a Lebanese belly dancer, embarked on a European tour with a Tunisian and Algerian opening act – the first Jewish-Muslim heavy metal tour of its kind. For Orphaned Land and the artists who work with them, these types of collaborations are small examples proving that coexistence is a real possibility. Perhaps the most impressive aspect of the Orphaned Land model is the community that has formed around the band. Orphaned Land’s official Facebook page has over 60,000 members; fans from all over the world use it to leave messages for the band, add articles and videos, and interact with one another. Many fans say that Orphaned Land has transformed the way they understand one another, the conflict and the potential for positive change. It would be easy to dismiss Orphaned Land as an aberration of no real significance. After all, how does a story of an Israeli band with Arab and Muslim fans compete with headlines about conflict? And yet, to do so is to misunderstand the potentially transformative power that is being created. Orphaned Land has weakened destructive patterns of perception and communication, and helped build new forms of relations and recognition about what is possible. The key is not to invest all our hopes in one heavy metal band, but rather to become cognizant of how positive change can take root. Roi Ben-Yehuda is a Professor of Conflict Resolution at the John Jay College of Criminal Justice in New York City. He is also a graduate student at Columbia University and George Mason University and blogs at RoiWord.wordpress.com. Originally published by Common Ground News Service. Reprinted with permission.